Erin Smith, left, and Susan McCarty, co-owners of Pay It Forward Johnson County at the Roudabout Project in White River Township. GREENWOOD, IN – A $10,000 grant has enhanced the beauty and maintenance of a White River Township roundabout. Pay It Forward Johnson County provided the grant, which was funded by proceeds of the Rock the Block Run event in April. The improvement project at the intersection of County Road 144 and Whiteland Road included landscaping, irrigation and drainage. The roundabout, which was constructed in 2012, is part of the connector system for the Whiteland Road Trail. The Johnson County Commissioners and Highway Department first improved the drainage along the roundabout. The Town of Bargersville then approved the landscaping plans created by Scott Rau of Primary Grounds. Allen Irrigation, McCarty Mulch and Brehob Nursery all donated time and resources to the project. Proceeds from the Rock the Block Run funded the grant. Powered by Pay It Forward Johnson County, the community run event, hosted on the Center Grove High School campus, has raised more than $50,000 to date for Johnson County charities and trail projects. Pay It Forward Johnson County is a nonprofit and volunteer-driven organization that hosts events and raises money for community impact projects. 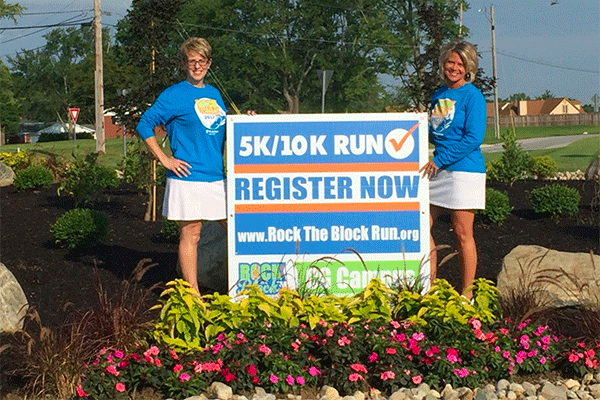 More than 1,500 runners and walkers participated in its second Rock the Block Run. The next event is scheduled for April 21, 2018.